Part 2 – “A small miserable hut”, Belgenny Farm, Camden Park Estate, Camden. The topography in the background of the watercolour drew us to the paddock to the north of Belgenny Farm – nowhere else is the background the same. Luckily the paddock appeared to have been spared any ploughing or cultivation, so we could see in the undulations possible field boundaries and a mound of stone rubble, to an archaeologist a sure sign for a collapsed fireplace. But there were three buildings shown on the 1840s Estate Plan. Were these built later? How would these three buildings affect our chances of finding the "small miserable hut"? In addition, a sandstone monument, erected in 1967, marked the presumed site of the "bark hut" to the south of where we found the mound of stone rubble. Did they know something we didn't? It was decided to approach the problem step by step. An archaeological assessment was prepared, the paddocks to the north of the sandstone monument were planned and historical plans overlaid to find the best fit. 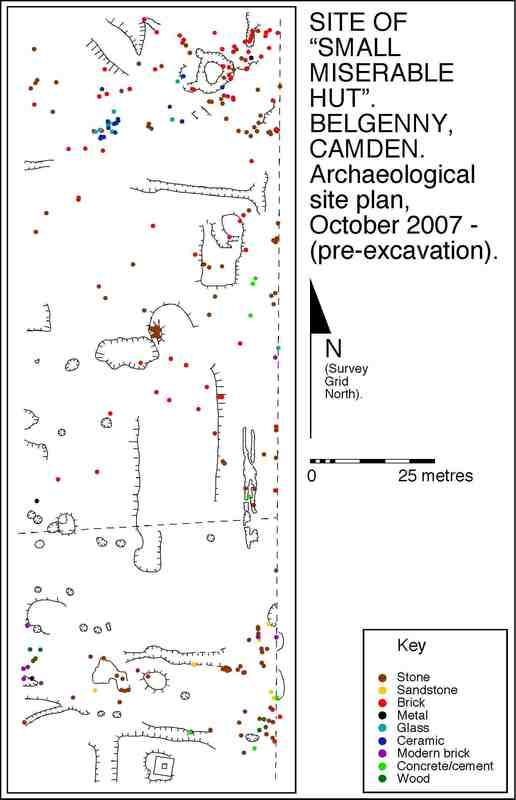 With an excavation permit approved, five small test-trenches were opened up in September 2008 to investigate the mound of stone rubble and the sites of the three other buildings shown on the 1840s Estate Plan. The results exceeded expectation. 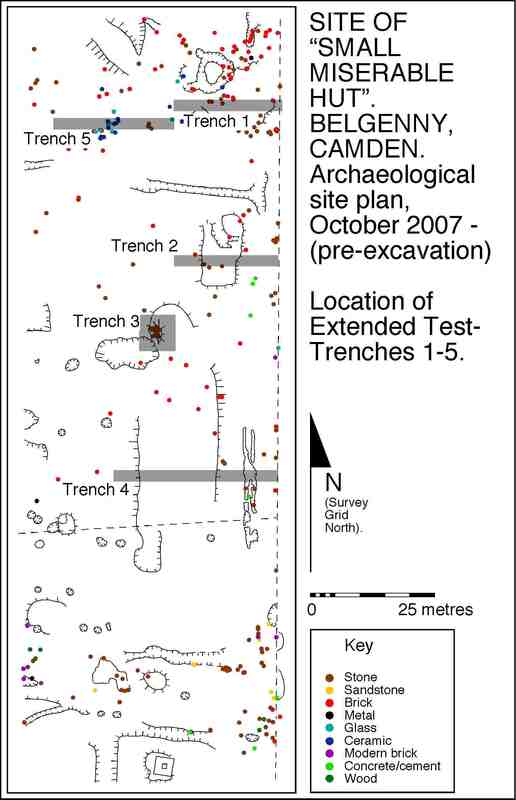 In Trenches 1 and 2 we found the stone foundations of timber framed slab buildings, the north and central building on the 1840s plan, but in Trench 4, the presumed site of the south building there was nothing at all. Yet in Trench 3 we did find the fireplace and then the wall slots for the end and side walls of a slab cottage, but this time with no stone footings. We measured the length of the end wall, 4 metres. If it was a typical hut, similar to the standard two roomed model, so common in the early colony, then the side walls would be twice the length of the end wall, 4 by 8 metres overall or 13 by 26 feet. The government huts, erected from the 1790s onwards in Parramatta, measured 12 by 24 feet, but measurements elsewhere show there was some variation in hut dimensions. 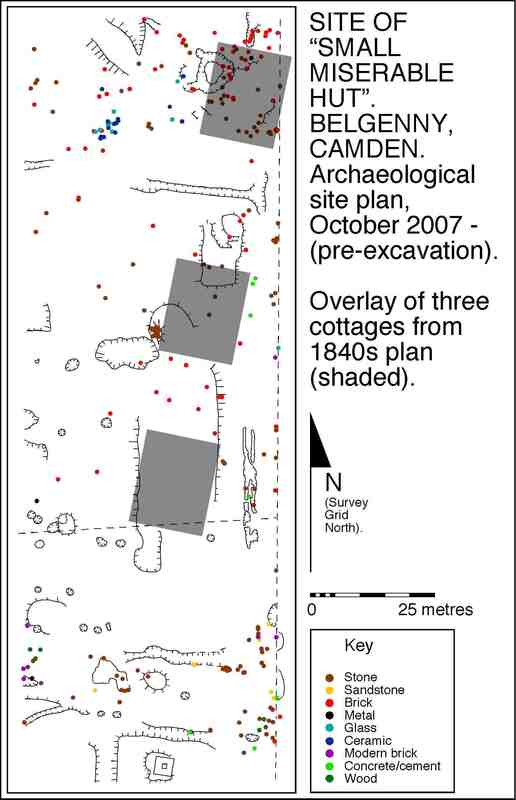 At this point, just before the media arrived on Wednesday, 10 September 2008, we realised we had a typical slab hut, exactly in the position indicated by Conrad Martens in 1836. Although all three buildings revealed artifacts showing occupation commenced before the 1830s, only in Trench 3 did we find small broken fragments of Chinese porcelain, a sure indicator of early occupation. Chinese porcelain of this type was imported into New South Wales from the 1790s to the 1810s, perhaps early 1820s. This was the clincher – we had our "small miserable hut". See Chinese porcelain. With the results of the archaeological excavation, the Belgenny Farm Trust will explore the many opportunities available for interpretation and display to extend their education and community programmes. This may include further excavation. Download the information leaflet for the excavation. See the web site constructed by the Year 11 students at Camden High School. See news articles in the Sydney Morning Herald and Camden Advertiser. Download excavation summary report for Season 1. Season 2 of the archaeological excavations has now been completed – see details. Many thanks to the Belgenny Farm Trust and to the several Macarthur descendents, who have assisted us on the excavation and with historical sources.